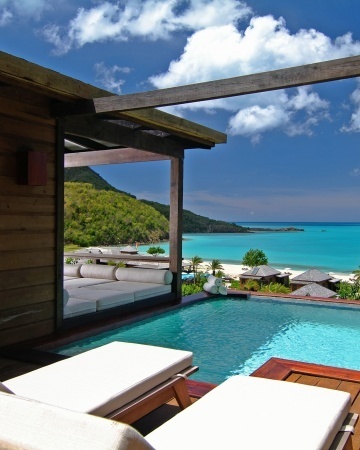 This is a view from the Hermitage Bay in Antigua. It would be nice to have a swim while enjoying the beauty of the Ocean. Awesome place to visit! Antigua also known as Wadadli, is an island in the West Indies, in the Leeward Islands in the Caribbean region, the main island of the country of Antigua and Barbuda. Antigua means "ancient" in Spanish and was named by Christopher Columbus after an icon in Seville Cathedral, Santa Maria de la Antigua—St. Mary of the Old Cathedral. The name Wadadli comes from the original Amerindian inhabitants and means approximately "our own". The island's circumference is roughly 87 km (54 mi) and its area 281 km2 (108 sq mi). Its population was 80,161 (at the 2011 Census). The economy is mainly reliant on tourism, with the agricultural sector serving the domestic market. Over 31,000 people live in the capital city, St. John's, at 17°6′N 61°45′W. The capital is situated in the north-west and has a deep harbour which is able to accommodate large cruise ships. Other leading population settlements are All Saints (3,412) and Liberta (2,239), according to the 2001 census.